Looks like the Scion TC. w/ the photochop. I like the WRC version. I must say...I do like that new front end...I want one now. Way too much like one. And the EVO design is quite ugly compared to the RS or STi. Also the design seems to be taking on a European look I think. Hey WRX-zero send your designs to Subaru. Two good things could happen. One they like the design and change the new look alittle and two they hire you for design refinement. Oh but dont forget who suggested it. 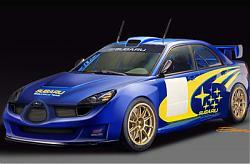 When you work for Subaru I expect a rally version of the STI sent to my house since youre going to make so much money. Well I dont know why people are crying, I kinda like the new look. Every "NEW" car design is kinda hard to like when you have warmed up to the current version. Its a car that subaru designed for the playstation game WRC3 , not neccesory Impreza. It could be similar but its probably different. The reason i think its different is... Subaru is good at hiding pre-production car. How many people have guessed that GD is gonna be bug eye before the release? I doubt they will leak out pre-production design by themselves. Its just for fun and to excite people I think. i just love WRX-zero's first desing its amazing! we are never happy, either when it is original (bug eyed) or folowing trends. dose anyone have a pic of the rear end? ...The GDA is a WRX, the GDB is the STi, USDM MY02-present (GCs are 1st gen Imprezas). As far as the supposed next gen Impreza - I am not impressed by their new designer. He may do to Subaru what Bangle did to BMW by trying to find new styling direction at the cost of regular customers who may not want to drive a super flamboyant extroverted car.